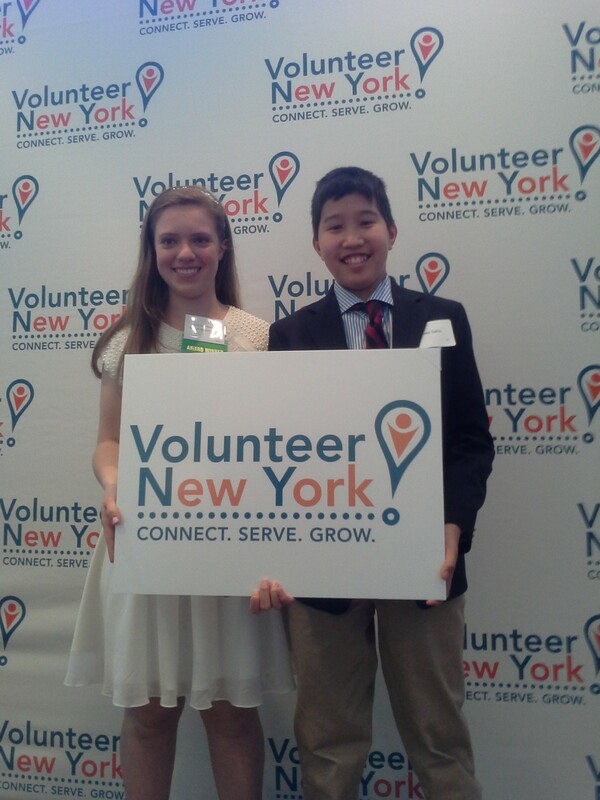 This is a picture of Mary Grace Henry, founder of Reverse the Course and winner of the 2014 New York Life Youth Leader Award presented at the 34th Annual Volunteer Spirit Awards held at the Doubletree Hilton Hotel in Tarrytown, NY. The proceeds from her reversible headbands go to fund boarding, uniforms, and textbooks for girls in Uganda. She also sent 500 pounds of sewing materials to school workshops in Kibera, where she also funds a teacher. Together, we met Betty Cotton, the winner of the 2014 Chairman’s Award. Ms. Cotton is an inspiration as she has served on numerous boards and is a member of multiple outstanding programs including the New York State Commission on National and Community Service, the Greyston Wisdom Council, the National Board of Governors of American Jewish Committee (and President of it’s New York Region), The Westchester Not-For-Profit Leadership Summit Steering Committee amongst others. I felt amazed at all of the inspirational people in the room with me. Volunteerism is the most important way a person can change the world for the better.